Pet Vaccinations: 4 Facts You Should Know | The Benefits Store, Inc.
People are often worried about getting vaccinated – as they should be. It’s one of the reasons August was named National Immunization Awareness Month; to make sure everyone remembers to get their vaccinations. Vaccinations can help prevent serious illnesses. Pet vaccines don’t protect pets; they protect people as well. For example, rabies kills more than 55,000 people around the world every year. If your pets become infected, rabies is one of the diseases they can spread to your family. You will want to get your pets vaccinated against this deadly disease. Diseases once killed thousands of pets every year. Vaccinations helped nullify the impact these diseases had – but they haven’t necessarily died out. Without proper vaccinations, pets are still susceptible to many of the diseases that may not be as prevalent anymore. 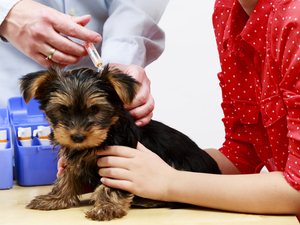 Pets are required to get vaccinated at a young age. If you have puppies or kittens, you should bring them to the vet to determine when they need their shots. Throughout the first six months, puppies will need to be vaccinated for distemper, measles, parainfluenza, DHPP, and rabies. Kittens will need shots for distemper, rabies, and feline leukemia. Both dogs and cats need regular booster shots every one to three years depending on the vaccine. For example, rabies shots should be administered every year. Rabies is often fatal for dogs, which is why it’s so important to keep to their vaccination schedule. These are a few important facts about pet vaccinations that you should keep in mind so you’ll remember to stick to your pet’s vaccination schedule. For more general advice about the health of your pets and your family, be sure to visit us at The Benefits Store today.